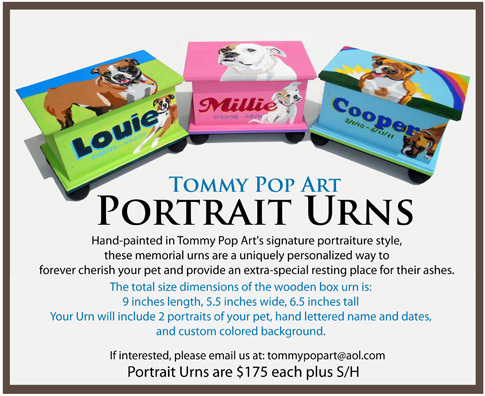 Click here to view our Tommy Pop Art Facebook page! 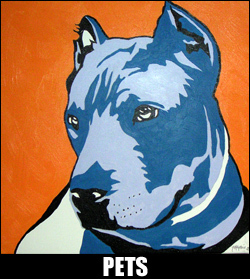 Please add $50 for each additional pet subject in a single canvas painting. All paintings are delivered mounted, completely painted alongside edges (see ex. painting on right), and ready to be taken out of the box and hung on your wall. No framing needed! Any larger sizes over 5 foot can be rolled and placed in tube for tremendous savings on shipping costs. What if I want a smaller size? 20" x 20" is the smallest size canvas. We also offer also offer incrementally larger proportional sizes: 24"x 24"; 30"x 30"; 32"x 32"; 36"x 36" and 30"x 40". If you would like a custom size not listed, just contact us to make arrangements. What's the biggest size painting I can commission? Any size is possible. Of course, it will be shipped rolled (and unmounted) if it is a size over 5 foot. The benefit of a large rolled piece is that is a tremendous savings on shipping costs. Are your paintings just limited to cats and dogs? 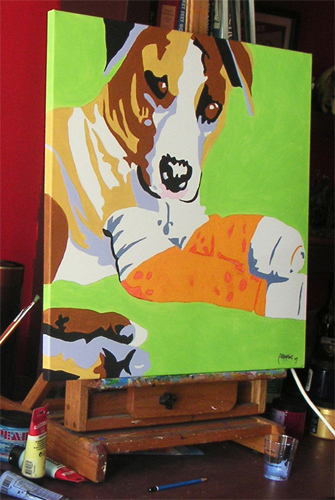 Tommy Pop Art can paint any pet, animal or person as long as a decent photo image is provided. Can you put two different photos in one painting? Yes, as long as they match in shading and values. Example: A dog on the sunny beach picture paired next to a dog lying under your kitchen table at 10 pm would look vastly different in colors and feel, and thus would not make for a good composition. How many pets or people can I put in one painting? It all depends on size of portrait. Example: A 30" x 30" would be an alright fit for two. However, the larger the size, the better for more subjects. For instance, a 30" x 40", being that it is horizontal, is a perfect fit for three/four subjects. What kind of photo is needed to create a pet portrait? A decent imaged sized color jpeg will work just fine. Try to avoid photos that are blurry, too dark or too light to clearly see the subject, or photos where the subject is obstructed and not clearly visible. Could you paint my child next to my dog? Yes. 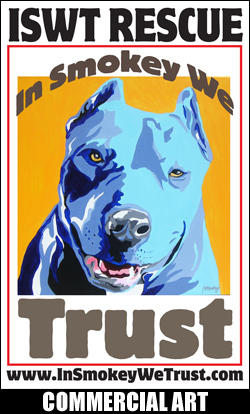 Pets and people can make great composition and create a keepsake that will last a lifetime. Please note that an additional charge of another subject will be added on to the painting price. Can I select the colors for my painting? Yes. Just notify us of which colors you like and which colors you don't like. Tommy Pop Art will compose a unique painting based on your choices. Can we give you an idea of what type of setting we'd like for our portrait, like a beach or a mountain background? Yes. You can gives us a description, or send a photo(s) for layout ideas. How can I frame my painting? There is no need. The portrait is painted along the edges (CLICK HERE to see example), so all you have to do is take it out of the box and hang it on your wall. If you would still like to get the painting framed upon receiving it, the mounting support is completely suitable for framing. Can I use my own FEDEX or UPS account for shipping? Yes. Any courier you choose can deliver the goods. And if you are in a 15 mile radius we can also deliver the painting ourselves when complete. How long does a painting take to be completed and shipped? It usually takes 8-9 weeks to complete once the check/paypal payment arrives, your jpeg/photo is submitted, and size and colors are established. Ground shipping usually takes 5 to 7 business days. Do you have to meet my pet in person to get a better perspective? It is not necessary, but since we are animal lovers, we'd always love to meet your pet! 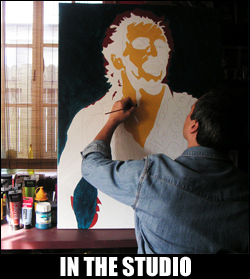 Where can I view the latest, up-to-date news items, events, behind-the-scene studio pics, and new painted portraits? 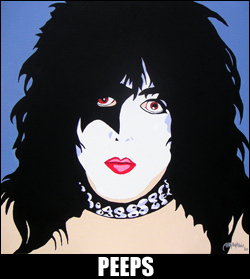 Become a Tommy Pop Art Fan on Facebook: TOMMY POP ART. All Rights Reserved by Tommy Pop Art and Thomas Athanasiou. Absolutely NO painting created by Tommy Pop Art or Thomas Athanasiou may be Reprinted or Reproduced in ANY FORM or by any means electronic, mechanical, photocopying or otherwise, without the full written consent of the artist. All artwork created by Tommy Pop Art can be used by Tommy Pop Art for promotion via electronic and print.